As the priest's wife, your role in the family is critical to making it all work. Once your husband is accepted for priesthood formation, he needs to go to seminary. In regards to how seminaries handle families, the policy differs from seminary to seminary. If your husband ends up going to Saints Cyril and Methodius Byzantine Catholic Seminary in Pittsburgh, PA, it depends on how your family is. If it is just you and your husband, they offer a dorm section which is meant specifically for married couples. If you have children and you don't want to go the "husband stays at seminary and you stay home with the kids the whole time he's in seminary" route, you and your husband will have to buy a house close to the seminary and live there for the years he is in seminary. You will also be invited to take part in various events with your husband throughout the year (like weekly Sunday evening Vespers which is open to the public) and might be asked for input on formation at various times. I should mention that your "Yes" makes the difference whether your husband gets ordained or not. If you say "No", the bishop will not ordain him. Once your husband is ordained and assigned to a parish, you will have to help him run it. As your husband goes about his priestly duties, it will be your job to manage the children (and of course he will take time to be with the kids too). If your husband doesn't make enough as a priest to make ends meet, are you prepared to take a job to help support the family? Even if he does make enough as a priest, can you deal with the stress of your husband frequently taking time away from the family to fulfill his priestly duties? Once your husband is ordained, he will be at the call of the bishop. If the bishop wants to move the priest from one parish to another, he will have to accept as part of his promise of obedience to the bishop. These days, it seems that moving priests around is a popular tactic for bishops instead of keeping them in a given parish for life. If your bishop says "I want you to go here", can you deal with moving every few years? Given the size of some eparchies or dioceses in the US, you might be asked to move a great distance from where you are currently located. As a priest, your husband will have to interact with other female parishioners. It is important that you not let jealousy act in any way here. Your husband will not forget that he is married to you when dealing with other female parishioners. The support of a priest's wife is critical. If the priest is having a hard time, the priest's wife's help and support can be just what he needs to lift his spirits and keep going through the day. You as the priest's wife are to be a good feminine example for other ladies in the parish in living a good Christian life. As part of the vocation of priest's wife, you also help keep your husband accountable as well. This is all I can think of for the role of priest's wife specifically at the moment. If Priest's Wife is watching, any input to improve this post would be greatly appreciated. In case you're wondering where the topic of this post came from, I got a tip-off from the Byzantine Catholic facebook group I am part of about a certain tweet put out by his excellency Bishop Tobin. For reference, I will display the tweet below. 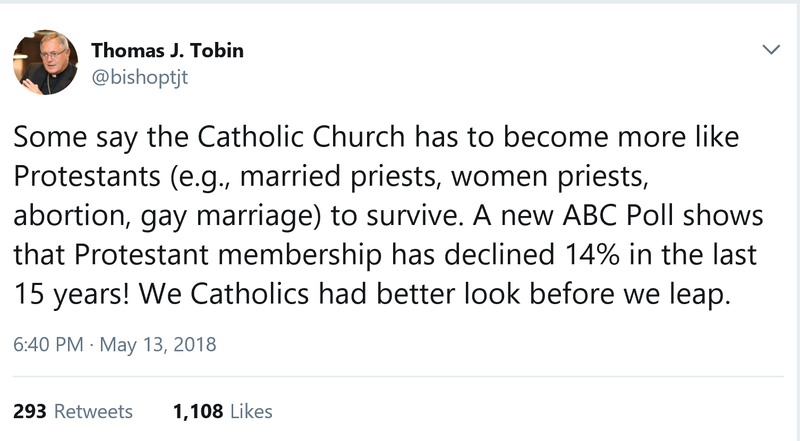 This tweet started a firestorm of replies from those who know about the Eastern tradition of married men being ordained priests. Reintroducing married priests (without special exceptions) into the Latin church is an idea that has been thrown around in recent years, but nothing has happened yet. If you have been wondering how that could work out (or how it does work out in the East), let me give you some idea. For the record, I am single (and looking towards the celibate priesthood), but I have priests friends who are married priests (including my current pastor/spiritual father). 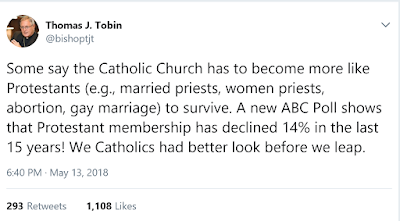 First, before anyone in the media attempts to twist my post, I will state how it works: married men can be ordained priests, but priests cannot marry. Why is this you may ask? Well, upon ordination to the subdiaconate (if you are a member of the Roman church who doesn't know what a subdeacon is, read up on Wikipedia), the man makes a promise of celibacy. What the status of the man is (at time of ordination) will influence how this promise is lived out. If a man is single at time of ordination, he cannot marry at any time for the rest of his life. If a man is married, however, he continues to live with his wife, but if his wife happens to die before he does, he is forbidden from marrying again. Because of this, there have been times where a man will delay ordination if he knows he will be married first. For the traddies and rad-trads out there, the priest's marriage status matters not sacramentally. A priest is a priest is a priest. The fact that he may be married does not change the fact that he can do anything that a celibate priest can do. The only exception is that married priests cannot be elevated to the episcopacy (while his wife is still alive). The life of a married priest is one of sacrifice. As a married priest, he has the obligation of fulfilling his marriage vows (helping his wife and kids to get to heaven) and the obligation of his work as a priest of Jesus Christ (being the shepherd that the bishop has put in place to help the flock of sheeple he has been entrusted with get to heaven). This is no easy task. As a married priest, there will be times where priestly duty will necessarily interfere with family life. Imagine, for a moment, the priest's wife has just finished making a delicious dinner for the whole family after a long day and everyone in the family has sat down and is ready to eat. Just as you've said grace and Father has given the blessing, the phone rings. A parishioner is in the hospital almost about to die and needs to be given the sacrament of the Anointing of the Sick. Father lets his wife and kids know what is going on and heads out to take care of his parishioner. As we can see, the duties of being of a priest can interfere with events in family life. Are you prepared to deal with that? A side effect of this is that family events often get planned around what is happening in the parish and in the church calendar that week. If you think the priest's wife has little part to play in this, think again. The priest's wife supports the priest in helping to run the parish. If the priest doesn't make enough money from his work as a priest to support his family, the wife will have to take a job. Even though this doesn't really happen in Eastern Catholic circles, I have heard of stories from Orthodox circles where the priest's pay wasn't enough to provide for his family, so the priest himself had to work a secular job just to make ends meet for his family. To me, no priest (Catholic or Orthodox) should ever have to worry about things getting that bad, but it happens sometimes (unfortunately). For the married priest, priesthood formation involves the wife just as it involves the man. In order to even be ordained, the wife has to say "Yes" to her husband presenting himself for ordination. If the wife says "No" to the whole thing, the bishop will not ordain him. There is an important bit of information I got when I went to the Come And See Weekend last year at Saints Cyril and Methodius Byzantine Catholic Seminary in Pittsburgh, PA. "As a married man, your first duty is to your family. If you have young children or newly married, it might be best if you wait a few years before you enter seminary". In other words, a married man thinking about ordination must have a stable household first. If you don't have a stable household, what makes you think you can manage both your own family and a parish family? I suppose I should add this section for any Latins reading this post. Unless the current discipline on celibacy in the Latin church changes, the Eastern bishops are fully aware of the celibacy discipline of the Latin church and are on the lookout for men applying for seminary in their churches just because the Eastern churches allow married men to be ordained priests and the Latin church does not. If you are (currently) ascribed to the Latin church and you want to get ordained in one of the Eastern Catholic churches, there needs to be some other good reason why you want to be ordained in one of Eastern Catholic churches. Even though the East has a history of ordaining married men as priests, celibacy still exists in the East and is still appreciated. All monastics are required to be celibate. In order to be elevated to the episcopate, a priest cannot be married. As a result, there are many times where the next bishop of an eparchy (eparchy <=> diocese, same thing) will come from among the monastics, but not always. In the East, a married priest must be free from sexual relations for about 24-48 hours before he is to celebrate the Divine Liturgy. This is why you don't usually find daily Divine Liturgy in the East (the married priest is busy fulfilling the marital part of his life). I think I have covered a good bit on the life of a married priest. If I am missing anything you think should be added to this, let me know in the comments and I will try for a part 2 with all the information I missed. On the priest wife end, I have this as well. Today in the US is Mother's Day. I want to first wish all of our mothers out there a most happy and blessed day today. When people mention Mother's Day, everyone usually thinks of the typical mom in the nuclear family (that has existed since Eve and Adam got together to produce the first children) that gave birth to us. However, Mother's Day covers more than that. We think and pray for all mothers out there, not just our own. On this day, we remember our own mothers, the one woman that brought you into this world. We thank her for all the sacrifices she has made for us and for putting up with us all these years. For those of you that are married (I'm not), we thank our wives out there for helping us bring children into the world and raise them to be good God-fearing people. On this day, we remember Grandmas and all mothers whose children are out living on their own. On this day, we remember all those women out there who are currently pregnant and will be new mothers soon. We pray that they may have a successful pregnancy and give birth to a healthy child. On this day, we remember all the mothers out there who have children that have died either after birth somehow or who have had a miscarriage. We realize this is a painful moment in a mother's life and we pray for healing for all those in this situation. On this day, we remember all those mothers and potential mothers that have had an abortion in their past. We pray that (if they have not yet) they realized the horror from that action and receive forgiveness and healing from Christ through the church so those women can move forward in their lives. On this day, we remember all those women that have tried (with their husband) to get pregnant and have failed. We pray that they may eventually have success and if not, that they be open to possibly adopting a child that needs a good home and a good father and mother. On this day, we pray for all those whose mother has passed away and that their mother may (if not there yet) eventually enter into heaven through our prayers and supplications. Motherhood can encompass more than just biological mothers. On this day, we remember all those women out there who are spiritual mothers, either in religious/monastic life or simply a spiritual mother to another girl or woman. Last, let us not forget about the Theotokos and ever virgin Mary, the greatest mother God put on this Earth. She said "Yes" to God and it is through her that the mystery of the incarnation, God taking on flesh and dwelling with us, happened. Thank you for all those mothers out there for choosing life and bringing wonderful children into the world. May God bless you all. First, let me take the chance to say that the blog is officially being revived. I realize that I should have been writing, but I have been neglecting it. Much has happened since I last wrote here. 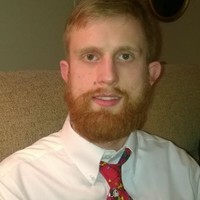 I have moved to the Midwest to the great state of Texas for work (I do miss West Virginia though), but I still remain active in the church as ever. Who would have thought that God would send me to a location where I not only have the largest F.S.S.P. parish in the US available, but also a Ruthenian Greek-Catholic church and a Ukrainian Greek-Catholic church as well? As of now, I am technically a Roman Catholic. However, through my learning on the interwebz and participating in the parish life of the Ruthenian Greek-Catholic church near where I live, the east has definitely grown on me. After having moved here in 2015 until this year, I had been mainly active at the F.S.S.P. parish and went over to the Ruthenian parish when the men's schola wasn't singing. As of this year at the recommendation of my spiritual father (he said I needed to place all my eggs in the eastern basket if I was to get his recommendation for seminary), I have been going full time to the Ruthenian parish. To get a feel for what I have to deal with, try this on for size: first, know how to serve not only the Ordinary Form of the Roman Rite, but also the Extraordinary Form of the Roman Rite and be able to read and sing Gregorian chant for the Mass. Are you alright so far? If so, add on the Eastern Divine Liturgy (Ruthenian adaption) and be able to both serve as acolyte for it and cantor it and other services (like the divine office) that the Byzantine tradition offers. If you want a bonus, try keeping in mind the Ukrainian adaption of the Divine Liturgy as well (I have been over to the Ukrainian church a few times as well and am friends with the pastor there, but will admit I don't know everything on the Ukrainian side). Welcome to my world! Christ is risen! Christos Vokrese (Христосъ воскресе)! As we well know, tomorrow is the feast of the Ascension (for those of us on the Gregorian calendar) when we will celebrate Christ's ascension into heaven. Pascha is not done yet, but we are winding down to the end of it after tomorrow with only a week and 3 days between the Ascension and Pentecost. I will be writing more on the Ascension tomorrow. I know this is late, but has your parish done anything special this Easter season? This has been fun. On a side note, I would like to start getting my viewing numbers up again. If you could share this blog with friends and family and stay tuned (for more), that would be greatly appreciated. Trust me, there is definitely more to come.